I was going to tell you that it’s my birthday, so there wasn’t going to be a menu tonight, but then I saw that JeffreyW posted some great looking red beans and rice (check out his outstanding photos! ), YUM. I knew I could find a menu to go with that, so here it is. I’m off to celebrate. Combine rice with water & chicken broth in a saucepan, cover. Bring to a boil, reduce to simmer, cook until all the liquid is absorbed (about 20 minutes). Over medium high, heat oil in skillet; add onions & sausage, cook until sausage is done in the center. Add sausage, beans, seasoning and tomatoes together into sauce pan. Keep heat low and let cook 10 minutes to let flavors blend. You can add shredded, cooked pork to the beans if desired. There are many variations on cornbread, this one is pretty basic. Mix together flour, sugar, baking powder and salt, add corn meal, mix well. Add eggs, milk and oil. Beat with mixer until smooth (do not over beat). Pour into baking dish and bake at 425° for 20-25 minutes. Light brown on top, toothpick should come out clean. I got a good one! And I kept notes! My opinion of comfort foods is you can never have too many variations of them. They make up childhood memories, start and keep traditions, and warm the soul like nothing else. Virtually every mother in the 60’s had a version of tuna casserole, usually from the back of a soup can. If you’re an ingredient control freak (like me!) you always appreciate making something familiar in a wholesome way. Every ingredient is readily available at any supermarket! Preheat oven to 350 degrees. Cook pasta according to package directions. While pasta cooks, mince shallots, cut mushrooms in half, then slice thinly. Saute in butter over medium heat with a pinch of salt and a small dose of pepper. When mushrooms start to release liquid, add in white wine. Cook until wine is almost but not quite gone. Add in flour and mix until paste coats bottom of the pan, about two minutes. Add milk and whisk vigorously. When sauce starts to thicken, mix in cheeses, vegetables, and drained tuna. Check sauce for seasoning and add more salt and pepper as necessary. By this point pasta should be done. Drain pasta and add to medium casserole dish. Pour sauce over noodles and mix thoroughly. Crush crackers in hands (you don’t want them too fine) and cover top of casserole. Drizzle olive oil over topping in thin stream until it coats most of top. Bake for 20-25 minutes or until casserole is bubbly and topping is golden brown. Only other thing you need is a glass of milk!! The original recipe was one of the peanut butter cookie recipes I’ve got laying around. It made peanut butter cookies that were, well, okay. The peanut butter taste was a bit on the subtle side. I had a bag of chocolate chips around, and one day tossed them in the next batch just as a boost. That made a huge difference. The mild PB works great at making the chocolate chips stand out. They’re pretty close to being our favorite cookie. No pictures. Make a batch and take your own instead. Trust me, you’ll prefer the result. Sometimes you just look around your kitchen, see what all you have in the house, and figure out what the hell to do with it. This was the end result of one of those long stares into the refrigerator where you calmly await the Lady of Culinary Inspiration to whack you over the head. It’s a take-off from an older recipe of mine that I think works better in this iteration! Pretty much everything here is readily available at the grocery store. 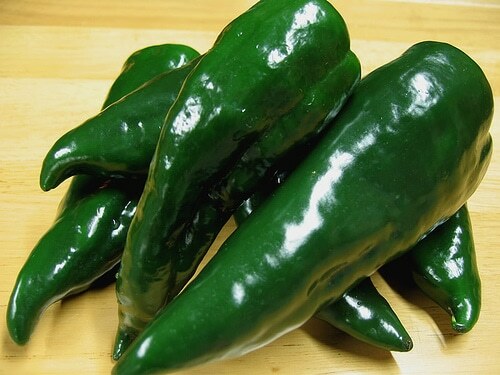 A tip for newer cooks: poblano peppers are the largish longish dark green chiles usually in the same section as the jalapenos. They should be dark, firm, and look like collapsed footballs. Enjoy! in a large pot, combine pork, chicken stock, 2 tsps salt, and spices. Bring to a boil then reduce to a low simmer. Cook for 1 1/2-2 hours or until meat is very tender. Watch liquid level so pork is always submerged, if necessary add in hot water to keep pork covered. About 20 minutes before pork is done, pre-heat oven to 350 degrees. In a large skillet, heat up 1 tbsp olive oil over medium-high. Add in onions, peppers, and 1 tsp of the salt. Allow vegetables to cook 10-12 minutes or until very soft with a little color on the edges. Two minutes before veggies are cooked, add in chopped garlic. When veggies are good and soft and pork is cooked, remove pork from the remaining liquid. Either with your fingers (if you have the Teflon fingers) or with two forks (if yours are more delicate) shred pork into small bits. Mix together corn starch and water, add to liquid in pot, mix in cilantro, and bring to a boil until thickened. (You want it thicker than water but not too thick, it will thicken more as things bake in the oven.) Heat tortillas in microwave on high for 60 seconds, 5-6 at a time, until soft and pliable. Place about 1 tsp each of the pork, veggies, and cheese in a tortilla, and roll. Place seam side down into a 13x9x2 baking dish, making sure things stay tight and folded in. Continue assembling until all the filling is used (you may need an extra pan) and ladle sauce generously over the top. Cover top of enchiladas with the remaining cheese. 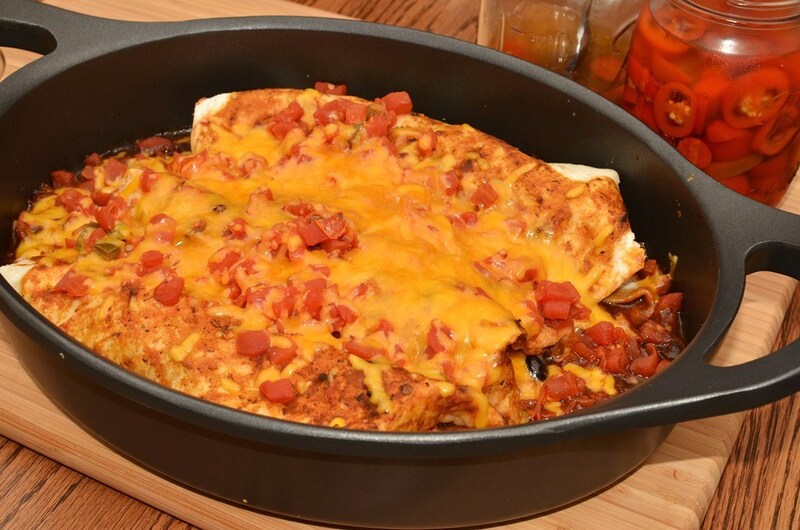 Place pan into oven uncovered and cook 30-35 minutes or until cheese is melted thoroughly and enchiladas are hot and bubbly. Serve with Mexican rice and refried beans. Ever have a last-minute gathering crop up? Sometimes you just have to have SOMETHING to serve folks. One quick trip to the grocery store and 10 minutes will put all this together. And folks will think you slaved over it! Best part is the ingredient list is very short! So it’s even fairly easy on the pocketbook! Chop green onion finely. Place in small mixing bowl. Flake salmon over onions, mix well with fingers. Add in cheese and cream and stir until well combined. Season with salt and pepper. Depending on how loose you want spread you can add in more cream. Serve either immediately or chill in fridge for two hours to allow everything to marry together. Delicious on crackers, toast points, or bagels! Mix together and knead. Add enough flour so that it’s not sticky. The dough should be elastic. Roll out and place on greased cookie sheets. Top with chopped tomatoes, pizza seasoning and parmesan cheese. Then add your favorite toppings and cheeses. Thanks Todd. So now you have a great pizza crust, what to put on it? I prefer a spicy tomato sauce with pepperoni and Italian sausage and lots of fresh mozzarella. But with a tasty crust like this, why not experiment? Fresh tomatoes and feta cheese on an olive oil wash. Spinach, mozzarella, bacon on a creamy garlic white sauce. Or a nice vegetable mix on either garlic or tomato sauce base: artichoke hearts, roma tomatoes, zucchini, spinach, mushrooms, red and green onions. Up the flavor and add some garlic, basil and oregano to the crust just before you roll it out. Enjoy.